Ask for a visit to the prison library. Prison libraries typically have the forms needed and free help available for inmates who want to file for divorce. Ask the librarian for the forms and the help the prison offers. Ask for a filing fee waiver or indigent affidavit form. Complete the main divorce forms. Forms vary by county but commonly include a petition, a summons to the other spouse and a court information sheet. You usually need your spouse's name and current residence, as well as the names and ages of any children you have together. Fill in all the information but don't sign. Complete the waiver or affidavit. A fee waiver or indigent affidavit is used by persons who don't have the money for the divorce filing fee. 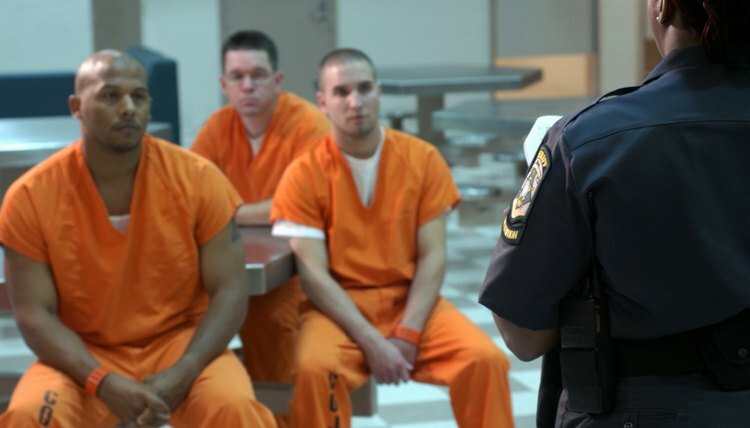 Courts commonly consider incarceration as a qualifier for a fee waiver. Talk to the prison's legal service. Bring all the papers with you. Tell the representative you want to file the divorce papers. The service should file the papers for you and return the documents you need, such as the filed summons and a blank service affidavit, to you. Arrange for personal service of the summons and a copy of the petition on your spouse. Talk to the prisoner's legal service for help. If they can't arrange for service for you, contact a friend who is over 18 and not related to you or your spouse, and ask him to personally hand the papers on your spouse. Mail him the summons, a petition copy and the service affidavit. Tell him he must complete and file the affidavit in the court you filed for divorce in, after he serves your spouse. Make arrangements to attend the hearing. Speak to your prison's legal service to find out if you can attend the hearing in person or by telephone.